No words...should've sent a poet! For the words that I can manage, I will say that, like planet Alderaan, I am totally blown away and my expectations have been completely exceeded. The actual guitar matches the reference/concept image I sent exactly. Carvin definitely knocked the skin off the ball on this one. The craftsmanship and attention to every detail is superb. The finish and fret work is exceptional. Nothing out of place. In tune, right out of the box and very easy to play. Acoustically, it is quite loud with a distinctive midrange, especially audible on the G string. I absolutely love the super flat 20" radius and ultra low action. It is strung with La Bella 8 gauge double-balls. The wood selection is beautiful (one piece alder). The DTS clear flame on the top and neck has a 3D quality when you rotate the guitar back and forth; worth the up-charge. Flames look like rills in the desert sand. The flamed neck has a nice, complex pattern with vertical and horizontal grain and the occasional birds eye. I am glad I went with gloss all over as it makes the grain pop. The neck is not sticky or slow. Neck carve is fat/thick but is immediately comfortable (to me at least). My thumb is very relaxed which is a welcome bonus. Only one thing left to do...get another one in the oven! WHOA!! That came out awesome man!! I've been so stoked about seeing this one and it does not disappoint. Stoked you got yours, colossal!! What a great build, love the single dot inlay at the 12th fret. Incredible guitar!!! colossal wrote: I will say that, like planet Alderaan, I am totally blown away and my expectations have been completely exceeded. Love the Star Wars reference! Most excellent! I know you'll enjoy every minute you put in on it! Gratz on your NGD! BWHAHAHAH! Can I use this? MAN, I love the guitar. I so want a guitar with just a bridge bucker! Wow! That warm natural color goes so well with the fretboard and black hardware ... and then the wee dot at 12 ... Very, very nice looking guitar. With all these gorgeous HH coming out I, have to put my credit card on suspend. But the GAS buildup is already at critical levels and I really have to get some new shingles on my house before it becomes a leaky boat. Ahhhh, patientce ... ya right, I've got none when it comes to Carvin Guitars. Must have another. Super happy NGD to ya Bro, you scored large on that top and neck, just absolutely perfect! First off, the way you describe the grains in the flame--like desert sand-- I really see that. That top is just amazing. I love the uniformity of the flame and the way patches of the darker striations are balanced evenly throughout the whole top. I wish I could see it in person to see the 3-D effect. I'm curious to see what it looks like where the alder meets the maple too. I like the flame on the back of the neck too. It's got a nice character to it, and it's a nice contrast to the flame on the top. The single dot at the 12th fret is really classy and I like it. I know a lot of people prefer the no-inlays look, but I like to see inlays on a fretboard whether I'm playing it or watching someone else play. Just having that single dot really splits the difference nicely. Plus it gives yours a nice custom touch that nobody else has, from what I've seen. Glad you're enjoying the playability too. The 20" radius is great, isn't it?! I know what you mean about the midrange sound. I really like that a lot. There are some spots within the tone/volume controls (and in conjunction with the right amp settings) where I can get really nasal horn-like tones when I want to. I imagine as I write this, you've got your HH1 plugged into your rig and you're checking out the awesome tones. 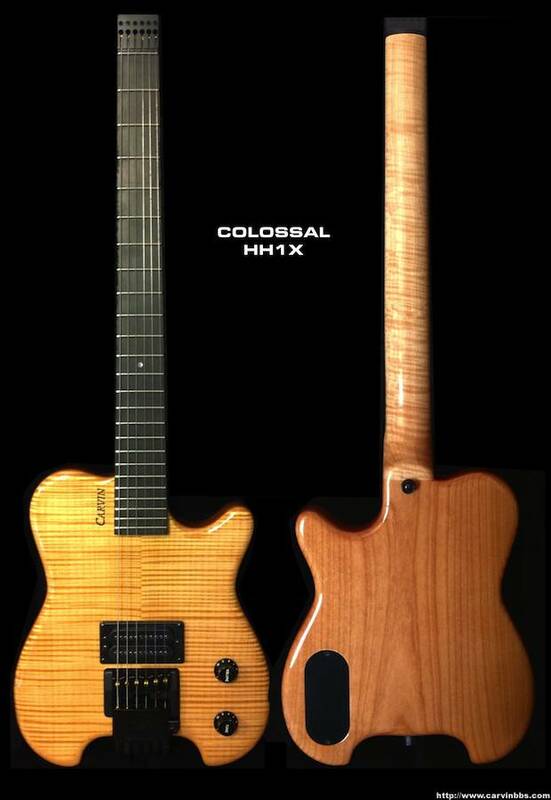 Again, I don't know if it's the pickups or the chambered design-- or likely both, but the HH guitars have really good tonal characteristics. It's funny-- they have such a little body size, but the sound is HUGE and the attack and sustain are unbelievable. Very harmonically rich and you crank it up and get that feeling like there are ghost notes hovering everywhere, like it's about to feedback, but it doesn't; you're always right on top of the wave and in control. Those are the times I miss having a trem. It took me a little while to adjust my playing to coax the best sounds from mine. I used to just rip from note to note, but with the tones I get from my HH, I like to slow down and chew on my notes a little more-- smell the roses, if you will. Even though I really love the neck pickup on mine-- last week I was playing around with sounds from just the bridge pickup (to imagine what it would sound like if I had an HH1) and I got a really wide range of tones-- even some that weren't too far from the sound of a neck pickup if I'm closing my eyes and being honest. Plus, in giving up a neck pickup, you've got a lot more real estate for that beautiful top to shine! Carvin rocks! They did an amazing job on your build. I knew from your initial mockup that they would pull it off brilliantly. Huge Congratulations on your new baby and I can't wait to see many more pics! There are some spots within the tone/volume controls (and in conjunction with the right amp settings) where I can get really nasal horn-like tones when I want to. It makes me think of several guitar players that achieve those brialliant tones and they all play different styles: Pat Metheny, Eric Johnson, Steve Vai, Andy Timmons, Allen Holdsworth and Ingwie Malstien (I probably spelled the last one wrong). Those are killer lead tones that just cut through everything and sound good doing it. Another killer lead tone that I like is that violin tone, again Eric Johnsson, Jason Becker and quite a few more. These are all incredible features that the HH models offer, and that's huge! No wonder it's such a great selling guitar. Wow, that came out very nice, the back looks super! darn (aka Structure used to hold water back)!!!! So this is the guitar (aka Droids) that you were looking for then?????? X-Mann wrote: darn (aka Structure used to hold water back)!!!! Dude! . . . Bass Fest!!! Alright, how about this one: "Help me Mark Kiesel, you're my only hope!" Once again colossal, that guitar is freaking amazing. Excited to hear how it plays and feels! Very nice build!! This guitar is gorgeous, and I LOVE the 12th fret single dot. Innovative and very tasty. Thanks for the kind replies. It is always fun and rewarding to share a new guitar with those that love music and guitars just as much. It is an incredible guitar and I've been having fun getting aquanted. LabyrinthShredder wrote: WHOA!! That came out awesome man!! I've been so stoked about seeing this one and it does not disappoint. Stoked you got yours, colossal!! What a great build, love the single dot inlay at the 12th fret. Incredible guitar!!! Thanks man! Yes, it came out great; I am very pleased. You're gonna blow a gasket when you get your HH2X. 11CaliSpecGT wrote: Most excellent! I know you'll enjoy every minute you put in on it! Gratz on your NGD! I've really been playing it a lot and it sounds great. Huge tone for its size! Very easy to play, they did a great job on setup. Dead straight neck, just like I asked for. OotMagroot wrote: BWHAHAHAH! Can I use this? Yeah man, love the single humbucker. I can get neck tones out of it with the volume and tone knobs and picking nuance, so it does what I need it to. Also, less string pull, weight, and more top visible from the absence of the neck humbucker. Works for me. Geddy wrote: Wow! That warm natural color goes so well with the fretboard and black hardware ... and then the wee dot at 12 ... Very, very nice looking guitar. Thanks a lot for the kind words Geddy. It's like Christmas in July. I'm thrilled with it and it definitely exceeded my expectations. I really look forward to practicing. Starting to think about another HH1X! Ha! Thanks Ted, yeah, I'm super stoked. Ain't she a beauty? I really love the natural beauty of woods and a minimalist approach. I'll try to post some more photos and especially of the neck joint, the side profile and some close ups. Photos don't really reveal the 3D grain but it's there for me to enjoy. If you hold the body up close and then tilt it back and forth in the light, the DTS really struts its stuff. Looks totally 3D. Eye candy! ted wrote: I like the flame on the back of the neck too. It's got a nice character to it, and it's a nice contrast to the flame on the top. The neck is pretty sublime. It's subtle but when you're looking at it while playing, it's something to enjoy. I do marvel at the neck as it's a nice match to the whole thing. Great piece of flamey maple. ted wrote: The single dot at the 12th fret is really classy and I like it. I know a lot of people prefer the no-inlays look, but I like to see inlays on a fretboard whether I'm playing it or watching someone else play. Just having that single dot really splits the difference nicely. Plus it gives yours a nice custom touch that nobody else has, from what I've seen. I can't take credit for the idea, I saw it on some AH prototypes. I thought it might be nice to break up the neck real estate and give myself a point to anchor to. I use the side dots and they are fine but in lower light sometimes it's nice to have just a subtle reference. But I didn't want inlays getting in the way of all that perfect ebony! ted wrote: Glad you're enjoying the playability too. The 20" radius is great, isn't it?! I know what you mean about the midrange sound. I really like that a lot. There are some spots within the tone/volume controls (and in conjunction with the right amp settings) where I can get really nasal horn-like tones when I want to. Man, it plays really well. La Bellas have a slightly different feel, a bit stiffer. Great tone. Oh yeah, I love that radius. The flatter the better. The midrange character is awesome, really what I've been looking for for a long time. It is loud and full. Someone asked in another thread if it can compare to a 335 and yes, I do hear an almost doubling of the note in a very organic sort of way that the hollow body vibration gives. Very, very resonant and you can really spend some time dialing in a level of control that exploits that quality. Horn tone! ted wrote: It's funny-- they have such a little body size, but the sound is HUGE and the attack and sustain are unbelievable. Very harmonically rich and you crank it up and get that feeling like there are ghost notes hovering everywhere, like it's about to feedback, but it doesn't; you're always right on top of the wave and in control. ted wrote: Carvin rocks! They did an amazing job on your build. I knew from your initial mockup that they would pull it off brilliantly. I am very much sold on Carvin. They did a great job and it shows. As I said, I will try to post some more photos. Now I'm thinking, hmmm? What would look nice on another one ?? RockCrue wrote: This guitar is gorgeous, and I LOVE the 12th fret single dot. Innovative and very tasty. Thanks buddy! I love it too. That little abalone gem on the 12th is nice in that field of ebony and stainless steel! Dude! Yes, I can attest to its awesomeness. You need one too (no peer pressure). Colossal, thanks for the replies to the comments! It makes me happy to know that you're really enjoying your new instrument so much. Sometimes I feel like a shill, because I'm always raving about how amazing these headless Carvins are-- so it pleases me when someone echoes my sentiments about the wonderful experience of owning and playing one of these. I keep looking at the pic of that flamed top and it's so pretty. The DTS is just hypnotizing. Looking forward to the next batch of pics! Love the flame neck & top... and that single dot fingerboard is TOO COOL! Love the flame neck & top... and that single dot fingerboard is TOO COOL! 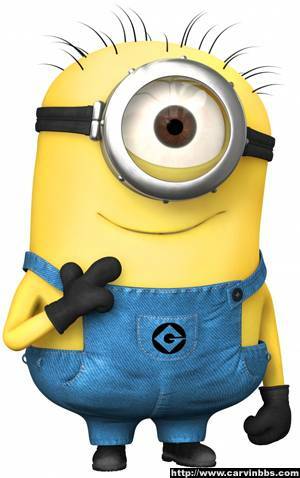 Overall, it kind of reminds me of my favorite minion Tim. Happy NGD! ROCK ON!!! Thanks dude! And a great NGD it was (and continues to be)! Man, I'm digging this guitar. gumbynotpokey wrote: Um, excuse me please. That guitar ISSSSSSSSSSSSSS SIIIIIIIIIIIIIIIIIIIIIIIIIIICK. Hey Colossal, I forgot to ask you about the trem. What do you think of the trem so far? I really would like to get an HH with a trem someday and I've read some reviews very critical of the trems; but then on the other hand, I've read some other reviews where people had no issues or, if they did, it was due to a setup issue or a small fixable installation issue, etc-- and once they got the problem fixed, the trem worked fine from then on. I love the stability of having a hardtail with tuners that I rarely ever have to touch-- but I'd love to have a trem too. just got my card in the mail. gotta wait till september for my hh2. i can wait. gonna do some heavy soda can / water bottle recycling to order another.